When it comes to insulation in buildings and houses, the main goal is to prevent uncontrolled air flow from and to the structure and to prevent water and humidity from accumulating within the premises. When the insulation is not intact, there are places where water can come in from the outside, usually rain water, and drip through the ceiling. Soon enough there's wetness on the structure's walls and ceiling, which can quickly develop into mold. When this happens, mold remediation and removal solutions are in urgent need. 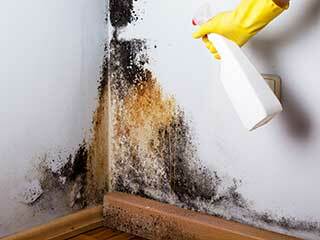 Mold is a type of fungus that gets worse by the minute. The problem is, that besides unsightly stains and an unpleasant odor, it greatly affects the indoor air quality and might risk the health of the building's occupants. Therefore, it is important to treat it as soon as we see that our house, business or any other building is contaminated with mold. Removing the mold is not done by simply sweeping the area and it is not enough to scrape it clean, too, but the whole infected area must be thoroughly cleaned and sanitized, in order to ensure the place is fully cleared of the hazard. When our technicians treat mold, they first run tests to discover what type of mold they're up against and where it's growing. Then they proceed to completely removing it and to locating the source of the problem. How to Identify Mold in its Early Stages? The main trouble with identifying mold, is that those who are not professional will most likely catch it when it's already in advanced stages and already affects the air that the building's occupants breathe. But following the next tips will give you the chance to identify it in its early stages: (1) Pay attention to dark and wet stains on the upper side of the walls and ceiling – wetness has to be treated so it won't grow mold. (2) Pay attention to the existence of a bad, moldy smell. As the fungus begins to develop it will spread a nasty scent. (3) Pay attention to the air you breathe; if it feels unclean, moldy, thick or stale it may indicate the existence of mold. Once you notice one or more of the signs (wall stains, bad smell, air quality) it is strongly recommended to call professionals to treat the mold or wetness. Remember, neglecting to treat the mold will eventually lead to health issues amongst your family, customers and guests, so be sure to treat it on time and maintain a healthy building for the sake of all its occupants. You can call us at Duct & Attic Cleaning Experts, Huston, for both residential or commercial services. You don’t have to go out of your way to find an effective product to kill mold and spores. The best are common household items such as bleach, vinegar, and hydrogen peroxide. You should spray it on the area covered with mold, scrub and then wipe it off. Use a mixture of diluted bleach (sodium hypochlorite), diluted vinegar or diluted borax, but only on tiles or non-porous surfaces, not on wood. Vinegar, a mild acid, will kill 80% of mold and mildew while the borax can also inhibit its future growth. You can also spray 3% hydrogen peroxide on moldy surfaces, wait for at least 10 minutes, and then scrub off and wipe. If you identify large areas of mold don't take any chances and call our professionals for safe removal. This process describes the treatment of mold or fungus-contaminated matter in various ways. This includes removal, sanitizing, cleaning, or various preventive maintenance efforts. The process includes a number of steps that must be carried out by a professional to avoid the potential health hazards involved in exposure to spores. One of the principal actions that must be taken is the removal of the source of moisture that facilitates the growth of new fungi, so special solutions are used. Many professionals use a comprehensive multi-step approach that includes giving the homeowners some useful tips to prevent future spread.